Liam stands at #2 in the US, a wildly popular pick for boys nearly unheard before the 1970s. 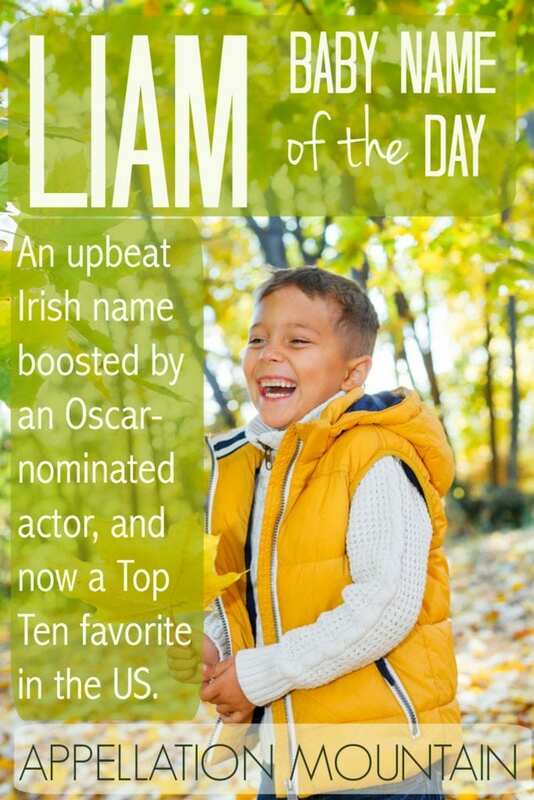 Thanks to Melissa for suggesting Liam as our Baby Name of the Day. William conquered England in 1066 with the Normans. His name came along, and then traveled to Ireland. Spellings included William and Uilleam and plenty of others, too. It is possible that the last two syllables were lopped off early and used as a nickname for centuries, but it’s hard to trace. What we know is that Liam rarely appears as an independent name until far more recently. In the US, the first year we find five or more boys given the name is 1947. Compared to William’s long history, that’s yesterday. A handful of notable men by the name are found in the history books and pop culture, including a prime minister of Ireland in the 1970s and one of the internationally successful folk group, the Clancy Brothers. By the 1960s, of course, the first wave of Irish imports had raced up the charts. Kevin and Brian led the way, with Ryan close behind. They became every guy names over the next few decades, until we all-but forgot their Irish origins. Liam entered the US Top 1000 in 1974, but it took some time for the name to catch on. Much of the credit goes to Irish actor Liam Neeson, known for action roles as well as serious, Oscar-worthy performances. He became a household name in 1993, playing the title role in Schindler’s List, and his given name jumped nearly 200 places in the US rankings. By the time Neeson played a Jedi Knight in the first installment of the Star Wars prequel trilogy in 1999, the name ranked in the Top 150. As the star turned in more and more blockbuster performances, the name continued to gain. By 2006, the name reached the US Top 100. One year later, actor turned reality show star Tori Spelling named her firstborn Liam Aaron and proceeded to chronicle much of his early life on her reality shows with husband Dean McDermott. In 2008, the rebooted version of 90210 – the show that made Tori a star – included a character by the name. Lost did, too. And then came 2011’s Teen Wolf, which introduced a werewolf by the name in a later season. Australian actor Liam Hemsworth has also become a star in recent years, lending even more visibility to the import. Add up all of the influences, and it comes as no surprise that the name has soared to #2 in the US. While the name still feels Irish, it now appeals to families of many backgrounds. In BabyCenter en Español’s report, the name comes in at #39 with Spanish-speaking families. The problem now, of course, is that parents often prefer to avoid popular names – or certainly any name this close to the top of the charts. That suggests that the name’s heyday could be ending. And yet, so far the evidence suggests that parents still see the name as a great choice – tied to tradition, but still fresh and modern. Do you like Liam? Does the name’s popularity give you pause, or would you still consider it for a son? The original version of this post was published on September 24, 2010. It was substantially revised and reposted on October 10, 2016. Starbaby News: Welcome Hattie Margaret! So how do you think “Liam” will wear over time? 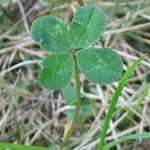 Will it be obvious when you were born because of your name? Yes, I do think that being named Liam will suggest a 2010s birthdate. And yet, not SO strongly that I’d worry about it. With boys’ names, they tend to stick around – even those that might feel a little more subject to trends. Some of that is because we tend to pass down names father to son, but some of that is because boys’ names are slightly less volatile. (Though that’s changing – slowly.) So I would guess that Aiden will still be in the US Top 100 ten, maybe even twenty years from now, when the first wave of Aidens are having children of their only – and, of course, some of those Aidens will be the sons of the first wave. Liam has history well before it became a go-to name for a generation. That will help it wear better over a lifetime. I’m sitting here next to my three day old Liam! I’m so glad I chose it, although on his baby bed the nurse did write “Lian” and gave us a pink blanket. Oh my. Congrats on your new little guy! What a great name. I’m planning to name my son Liam. I like that it is an Irish name like mine (Shannon) and it just sounds sweet without remaining a juvenile name- the kid could grow into a man with this name. Its also the only boy name my husband has liked. I want to pair it with a Latin sounding middle name, but cannot think of one that fits. Any suggestions? I love Liam Apollo – the right blend of current and quirky! I fell in love with the name Liam 15 or more years ago, and so when my son was born 2 years ago, Liam it was. And it fits him, trendy or not. However, I was shocked and pretty disappointed to learn that after all that time my favorite name had become so popular all of a sudden. Funny enough though, in the tiny southern town where we live, Liam is still completely uncommon. People call him “Lem” a lot, and we get comments like “oh, that’s an interesting name.” I even had a nurse call him “Lie-am” once, and someone else “Lion” which I’m sure he thought was pretty cool. Still I find myself thinking sometimes, “Really, as popular as this name is, and you’ve never heard of it?! !” I guess that’s something good about living in such a small town! Funny how nicknames change over time, first Will and Willie, then Bill and Billy, and now Liam. And Will! I never, ever hear Billy on a child these days, but Will? I can name a few. I love Liam. I had a Great Uncle Liam growing up whom I have extremely fond memories of. I was sorely tempted to use Liam for our son but didn’t in the end. Not quite right with our surname. My husband is the fifth William in his [recent] family, so we’ve been planning for years to name our son William and call him Liam. This year my cousin named her new son Liam. *sigh* I’m really against family members reusing the same names, but there’s no way we’re changing our minds. It’s *the* perfect name for us, and I love it. I’m just so angry with her for using it first. The name isn’t too common in our area, so I wasn’t worried about running into a lot of Liams, but now there’s one in the family whom we will see at every family gathering. UGH. It would be nearly impossible to fight that kind of family name tradition, Panya! 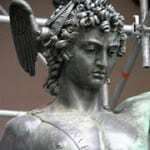 Alexander is wildly popular, too, but we were in the same boat – no way was my husband naming his firstborn son, the first grandson, anything other than Alexander. I’ve found that when you have SUCH a compelling reason to use a name, it doesn’t matter how popular it is. This was my first favorite boy’s name (along with Rowan), and my crush on it lasted about five years. There was a little boy in my class that year with the name who always told tall tales about himself (he could drive a car, he had a talking cat) — I immediately think of him when I hear it. Also, I was really surprised when the list came out and I saw William had become so popular — but maybe Liam could be the reason why! OOO … I love Liam. Its on the list, but I didnt know it was so trendy, that kinda lessens its appeal for me . I guess I like his brevity and cross the Atlantic charm. Liam is crazy popular here in Western Canada. It’s sitting at #2 in British Columbia where I live, and is pretty high on the charts in many of the other provinces. I think it’s a pleasant name, but it’s not to my taste and I’m not quite sure what makes it so extremely popular. My niece has a half-brother named Liam. While I’m sure he’s a lovely child, I can’t stand my brother’s ex-wife, so that association taints the name. I love Liam, but that’s primarily because I have a great personal association with an old friend from Belfast. Regarding the mega popularity of Irish names, I do think it’s amusing considering the history of Irish immigrants in the U.S. Not so very long ago, they were looked down upon as (to put it lightly) the less-than-ideal immigrant. Now, if someone is even 1/16th Irish, they can be seen scrambling for an Irish name to bestow and show off that Irish heritage. Funny how times change. It makes me wonder if in 20 – 40 years we’ll be seeing a similar trend with Hispanic names. Will people with Polish and Irish surnames suddenly be digging through their heritage to find a tiny bit of Mexican lineage? LOL, Kelleita that is a GREAT point! If we have Aidan Greenblatt in 2010, maybe he will be naming his kiddo Diego. I really dislike Liam, always have, don’t know why. I’m with you; I hate Liam but love Will. BTW, I think Calista Flockhart’s adopted son Liam raised the profile of Liam as a baby name far sooner than Tori (ick) Spelling. Of course, Joy! And that was 2001 … more influential than Tori and Dean. I really like Liam – he just seems so friendly. The name was on my baby name list in 2005 – though we ended up with a girl and my husband wasn’t keen on Liam anyway. I did grow up (in the UK) with a friend my age who had an older brother called Liam. The brothers were Dam!en, L!am, A!den and T!mothy – born in the late 70s mainly, I guess. I’m totally impressed with the name set, now that I’m all ‘name nerdy’. We didn’t revisit Liam when we did have a son. These days I’d probably be more likely to put William on the birth certificate and then just use Liam as a nickname. After all, Rose, Henry and William would make a more ‘formal’ set of siblings. I love Liam, but it is insanely popular where I live, along with Ethan and Aidan, so I don’t think I could bring myself to use it. I suspect the short and sweet yet solid sound of it is what appeals to many parents; I think the similar-sounding Leo is rising in popularity for the same reason. […] and I’m not sure Rod has mastered the art.